hen the Honda Aircraft Company Inc. announced last summer that it would place its world corporate headquarters at Piedmont Triad International Airport in Greensboro, N.C., the news only confirmed what local business leaders already felt: Global companies want to locate here. The prize of 50 new corporate jobs pales in comparison, however, to the international acclaim that Honda Aircraft gives the Greensboro- High Point metro area – the No. 1 second- tier MSA in the nation last year for new and expanded corporate facilities. With 33 such projects in 2006, Greensboro- High Point edged out second- place Grand Rapids- Wyoming, Mich., which had 32. In the category of communities with population between 200,000 and 1 million, the remaining top 10 MSAs were, in order, Huntsville, Ala.; Tulsa, Okla.; McAllen- Edinburg- Pharr, Texas; Raleigh- Cary, N.C.; Durham, N.C.; Hagerstown- Martinsburg, Md.- W.Va.; and a three- way tie for ninth between Dayton, Ohio; Fort Wayne, Ind. ; and Albany- Schenectady- Troy, N.Y. The combined capital investment of Greensboro- High Point's 33 corporate projects last year came to $619 million – and that figure stands to increase in 2007. 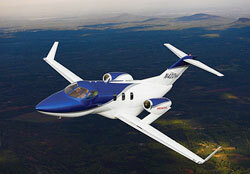 Honda Aircraft followed up its headquarters arrival with the Feb. 9, 2007, announcement that it had selected Greensboro for a major manufacturing project. The $60- million initial investment will include a 147,000- sq.- ft. (13,656- sq.- m.) hangar, while the second phase will include a 150,000- sq.- ft. (13,935- sq.- m.) manufacturing facility. More than 300 workers making an average annual wage of $75,000 will be employed. The facility at PTI Airport will manufacture the sleek new HondaJet, a six- seat airplane that sells for about $3.65 million. The company plans to make and sell about 70 jets a year, but it is still awaiting federal approval. "Companies want to move here because we are centrally located on the East Coast, we have construction- ready sites available for building, and we have been the manufacturing center of North Carolina for 125 years," says Dan Lynch, president of the Greensboro Economic Development Partnership, which represents an area of 678,000 people, including 350,000 workers. "We have a diverse manufacturing sector that includes furniture, aviation, life and bio- science projects, and cell phone wafer manufacturing," says Lynch. "We also offer an excellent quality of life."